We don't just sell parts at Convertible Service! We are experts at convertible top mechanism repair and replacement. Over 35 years of experience repairing convertibles and manufacturing replacement parts has given us insight into engineering and producing products that meet or exceed OEM specifications. Shop with confidence. 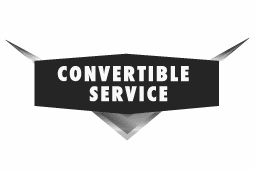 At Convertible Service, we are commited to service after the sale. We back our new Convertible Top Lift Cylinders, Hoses, and Hydraulic Pump Motors with our Industry leading 5 YEAR WARRANTY. We make our products at our San Gabriel, California Sales, Manufacturing and Repair facility. All of the products that we manufacture are made in the USA. And most of the products we offer that we don't make are also made in the USA.